Although a home health aide works independently, he or she is supervised by a medical professional, usually a registered nurse. Be careful not to confuse home health aides with personal care aides who don't provide medical services of any type. Training: Home health aides receive on-the-job training from registered nurses, licensed practical nurses, or experienced aides. Some states require anyone working in this occupation to have formal training which vocational schools, community colleges, and home health care agencies provide. Evaluation: Home health aides who work for agencies that receive Medicare or Medicaid reimbursement must, according to United States law, complete a state-approved training program and a competency evaluation (Centers for Medicare and Medicaid. Home Health Agencies: State Operations Manual [PDF]). Some states place even more stringent requirements on agencies receiving Medicare and Medicaid reimbursement. In addition, several states license, certify or register home health aides. See the Licensed Occupation Tool on CareerOneStop for information about the requirements in individual states. Interpersonal Skills: In addition to stellar listening and verbal communication skills, you must be able to connect with your patients and their families on a personal level. It is essential to gain their trust so you can make them feel safe and comfortable. Time Management Skills: You will have many tasks to complete during your shift. The ability to prioritize them will help you get everything done. Because of its excellent job outlook, the U.S. Bureau of Labor Statistics has designated this a "Bright Outlook" occupation. 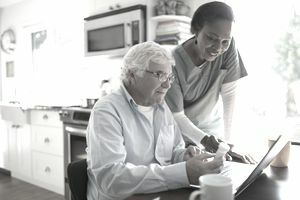 The outlook for home health aides over the next decade relative to other occupations and industries is very strong, driven by the aging baby boomers and demand for in-home healthcare services. You can go directly to the website of care facilities and apply for jobs posted on their sites. You can also find home health aide job listings on job boards such as Indeed.com, Monster.com, and Glassdoor.com.